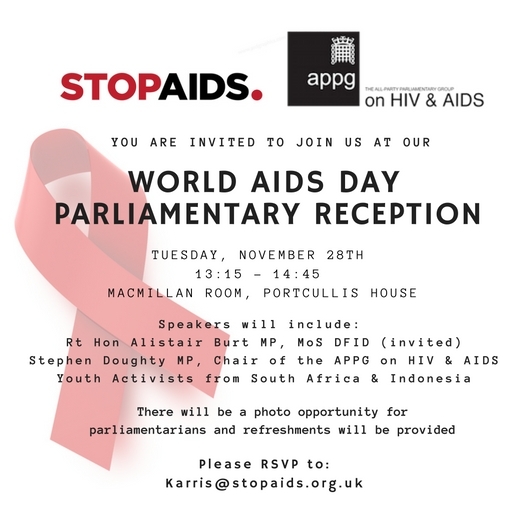 On Tuesday November 28th STOPAIDS and the APPG on HIV & AIDS are holding a reception in Parliament for World AIDS Day from 13:15- 14:45. We are excited to invite our members and colleagues to attend and commemorate World AIDS day with us. There will be speeches from DFID Minster Alistair Burt (invited), youth activists from South Africa and Indonesia, Stephen Doughty MP and Chair of the APPG on HIV & AIDS and a representative from the private sector. We will also have a networking and photo opportunity for parliamentarians and STOPAIDS partners. At the event we will celebrate the role of young people as partners, leaders and advocates within the global response to HIV. We will also discuss the important role civil society plays in reaching groups most affected by HIV, including young people. Refreshments will be provided! Please RSVP to karris@stopaids.org.uk.